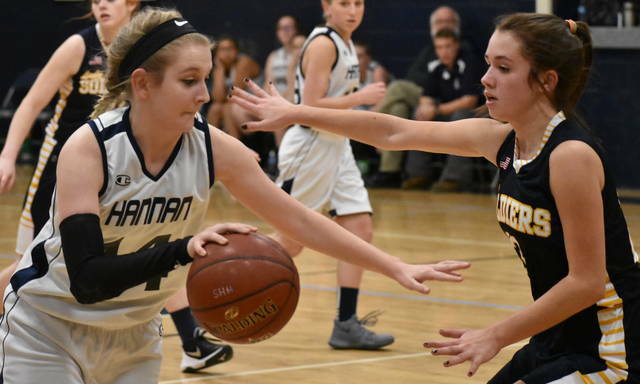 Hannan sophomore Julie Frazier (4) attempts a shot against a Grace Christian defender during in the second half of Tuesday night’s girls basketball contest in Ashton, W.Va.
ASHTON, W.Va. — Too many turnovers, not enough points. 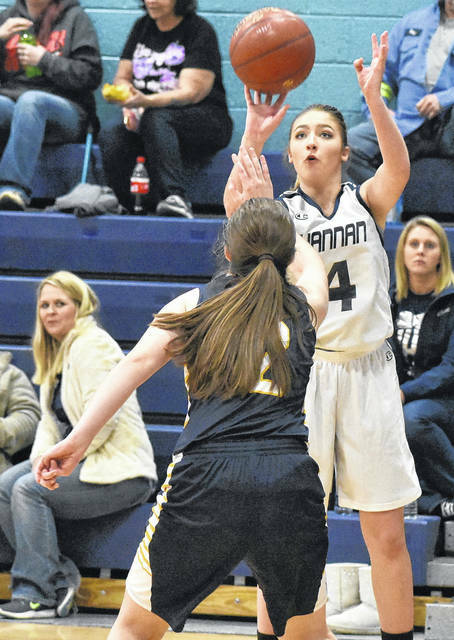 The Hannan Lady Wildcats committed a total of 38 turnovers — 21 of which came in the first half — and visiting Grace Christian led from the opening tip to the final buzzer Tuesday night as they marched to a 52-20 victory in a non-conference contest in Mason County. The Lady Cats (1-9) mustered a single field goal and free throw in the opening period, as the Lady Soldiers (12-1) built a 20-3 advantage after eight minutes of play. 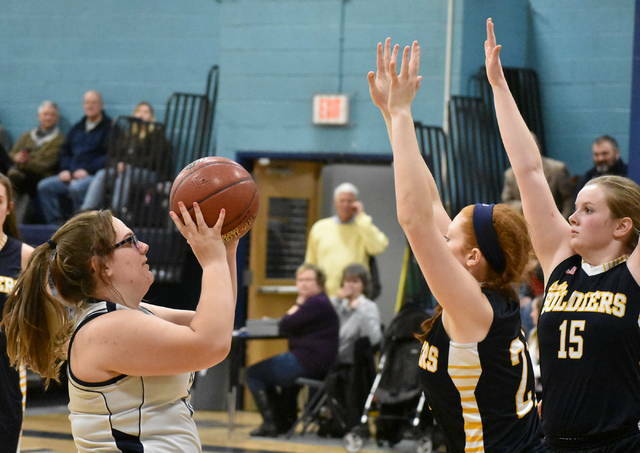 The Blue and White managed just one field goal in the second frame, while Grace Christian had only eight points to take a 28-5 lead into the intermission. The Lady Soldiers dominated the glass in the low scoring second quarter, as they pulled down 15 rebounds compared to just two by HHS. Overall in the contest, GCHS outrebounded Hannan 42-24. Grace Christian followed the halftime break with an 18-7 blitzing of the Lady Wildcats. HHS struggled at the charity stripe in the third frame, as they went just 3-of-7 shooting 42 percent as a team. The Lady Cats — who outscored the visitors by an 8-6 margin in fourth period — ended the final quarter with 11 rebounds. HHS connected on 8-of-36 field goal attempts overall for 22 percent, which included a 0-of-5 effort from behind the arc. Hannan was also 6-of-13 at the free throw line for 46 percent. Julie Frazier led the Lady Wildcats with eight points, followed by Lindsey Holley with four points. Bailey Coleman and Halie Johnson were next as each contributed three points. Pammie Ochs completed the Hannan scoring with two points. Grace Christian netted 21-of-64 shot attempts for 32 percent, including a 3-of-17 effort from three-point range for 17 percent. The Lady Soldiers were also 7-of-12 at the charity stripe for 58 percent. Rachel Tanner led the way for GCHS with a game-high 19 points, followed by Susanna Wagoner with 12 points. Malorie Branson was next with eight points, while Samantha Wells had six points and Shay Cincenas had four markers. Rounding out the scoring were Hannah Benge and Abbie Patterson with two points and one point, respectively. Hannan returns to action on Thursday when they host Sherman at 6 p.m.